(JERSEY CITY, N.J.) — Since I left, I have been re-reading John Steinbeck’s Travels With Charlie like a bible. I have been taking in the pages slowly, five or so at a time, while treating them like mini lessons on travel, writing and life. According to him, while you’re on a trip, you don’t really understand a place until you leave it. That’s when the perspective comes. I completely agree. I’m near New York City, surrounded by the intense yet friendly busyness of America’s biggest town, and what do I really think I understand? Not this. Maybe my time in Pennsylvania. It was there where I recently turned into a smiling, crying dork, as I watched my friend, Rebecca, get married at an old farm. I loved it. Probably because of the informality and individualist spirit of my family, I have an inherent lack of understanding about big gatherings, especially weddings with their DJs and catered food and billowing event tents. But as I sat in the audience of this union — as Pachelbel’s Canon played and people snapped pictures — I was overjoyed. I was drunk off of everyone else’s elation. I was also simply amazed to have made it. The thing about traveling that is both heartening and frustrating as hell is that wherever you go, there you are. All those parts that you don’t like about yourself (along with those you do) come with you everywhere. One thing I hate about me is that I am late a lot. This is not all the time but enough that people take notice. I am the kind of person who will go out my way to attend your play/christening/bat mitzvah/bridal shower. I will make that happen. But I am also the kind of person who might just be late to it. Don’t ask me to explain. I can’t. 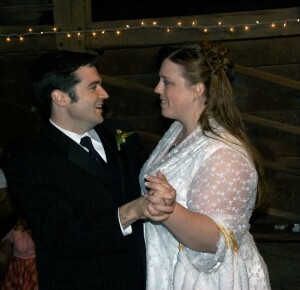 I left for this wedding on the day of from Salem, Mass. It was 9 a.m., and the ceremony was at 3 p.m., and I knew the drive was supposed to be about six hours. Even in an unencumbered truck, it would have been a tight fit. With the trailer, it was going to be near impossible. I had woken up late and gotten lost and whatever, and for a few hours I drove and kicked myself at my lack of planning. I started to wallow. It wasn’t until I stopped for gas, a hundred or so miles down the road, that something shifted. A tiny bit of resolve started to grow, and I made a decision. I am going to make it this thing, I told myself. I will. I will. I bought two Red Bulls and a few candy bars at the convenience store, and that was it. I was dedicated. Legally, I can’t drive more than 55 miles an hour while pulling my trailer. Like most trailer folks I’ve seen, I usually end up doing around 60. But as I made my way south, I caught myself driving 70 at times. New England passed me in a blur. Mostly, what I saw were trees and traffic, but I could sense a shift in the geography happening. It was getting less quaint and more hardscrabble, and I felt less and less surrounded by Sunday drivers. Things seemed to be getting more and more real, and I felt both excited and kind of disenchanted with that. I listened to the radio; I ate my junk food, but never did my attention leave my destination. Rebecca and I haven’t even been in touch all that much since we graduated, but that didn’t matter. She had been a good friend to me freshman year, and though I had never fully understood her, I wanted to. I wanted to be there, show my support. I kept on calling our mutual friend, Erik, and telling him my location. He continually told I was going to miss it. I kept telling spouting out optimism. When I reached Pennsylvania, I had about 30 miles and 30 minutes to spare. I was actually shocked that things had gone so well. My mantra of “I’m going to make it” kept going through my head. Even the maze of my commercial, suburban surroundings weren’t enough to scare me off my goal. I’m going to make it. For a short time, I morphed into Steve Carell’s gay uncle character in Little Miss Sunshine (you know, at the end, when he’s running like his life depends on it to reach the pageant? Is that too obscure?). As I neared the driveway for the wedding’s farmhouse locale, I saw a parking lot for some shipping business that I prayed wasn’t open and pulled into it. It was 3:05. I ran into the trailer and striped down, pulling a dress over me and literally running out the door. The breeze was cool, and the sun was nice, and I felt elated, even though I was almost sure I was missing it. At least I had arrived. Thank God the bride had just arrived as well. By the time I got to the wedding site, an outdoor scene, surrounded by grass, trees and a barn, I actually had a few minutes to spare. Usually, I would feel pretty out of place in a crowd of dressed up people I didn’t know, but I had too much adrenaline for that. I was downright giddy, and when the bridal party started to walk down the aisle, my excitement only increased. My incites about those moments are pretty basic. I just took in the scene. 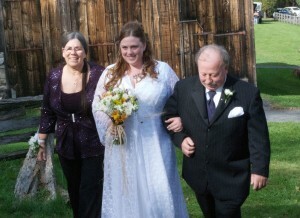 Rebecca, in her flowing, white gown looked happy and Erik, her best man and one of my best friends, looked handsome. Michael, the groom, looked proud. They were all beaming. The audience was beaming. I was beaming. Being there wasn’t an obligation; it was a gift. Toward the end of it, as the couple read their vows, I tried not to tear up. When Michael said something to the effect of “Finally, this lonely Homer has found his Marge,” I was a happy, crying fool. After the ceremony, and after I had congratulated the bride and groom and started to sip a glass of wine to take the edge off my high, I realized this was the first time I had ever seen a friend get married. So, I guess it made sense that I didn’t know what to do with myself throughout the night. I don’t know the wedding drill. I ate, danced a little bit, chatted up some of Rebecca’s older friends and family. But never did I get drunk or make-out with anyone (though that spiky-haired, short groomsman did waft through my mind more than once). 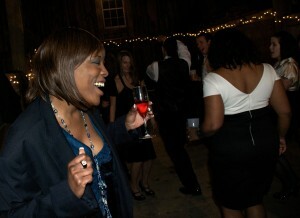 I never let myself become happily lost in the effervescence of the after party. For me, the real beauty of the whole event was the wedding itself. To watch two people make a decision about which they both looked so sure was invigorating. It gave me gallons of hope. I wanted to be swept away in the reception, too, but never quite got there. Reading this, you might think that I want my own nuptials to be right around the corner. But that’s not the case. As I saw Rebecca’s life change before me, I did think about my future guy, whoever he might be, and wondered how we might meet each other. I thought about what kind of casual wedding we might have, held on someone’s lawn, with a potluck instead of catering. And I thought about the type of place we might live, hopefully in the Southwest, somewhere with space, chickens and few neighbors. I want that, so badly. The idea of me going without that sounds like no fun. I don’t want it now, though. That’s a big part of what I was thinking as the wedding party swirled around me. I want this, I could almost hear myself saying, I want this. But not yet. The best man, Erik, sharing a dance with the bride. Stina… reading this almost made me cry. Yours is actually the only face I remember while walking down the isle thinking “yippy, she made it!” (Erik had given me all the updates on your progress the whole morning).